Sequential Fuel Injection (EFI) with a speed density air metering system,a true dual exhaust system with race inspired H-pipe crossover design, bullet proof forged flat top pistons with 9.2:1 compression ratio with the new casting E6 high swirl heads. The 5-liter Mustangs were fitted with a sturdier 8.8 inch rear and larger clutch. Magazine road tests proved that the 1986 Camaro/Firebird models were no match for the 1986 Mustang GT on the drag-strip due to GM's revised emissions friendly cam design for the F-body cars in 1986, which was dropped the following year and replaced with a more performance minded camshaft... as well, GM would up the ante the following year with added cubic inches borrowed from the Corvette. 1986 would be the last year for the four headlight (four-eyed) front design used since 1979. Top automotive publications tested 1986 Mustang GT 1/4 mile times from 15.3 to 14.6 range. Like the F-body cars produced by Chevrolet and Pontiac, the Fox-body also had a cousin in the Mercury Capri. Sadly 1986 would be the final year for the Fox-body Capri. 1987 had a new look with new front fascia and head-lights (aero), tail-lights, rear spoiler and ground effects and a complete interior redesign. The flat top pistons and E6 high swirl heads were replaced with the Ford truck castings, the E7 heads and a 9.0:1 compression ratio. Larger diameter 60mm throttle body and upper H.O intake plenum was added to increase Mustang power output by 25hp.The '87 Mustangs were treated to bigger disc brakes up front. 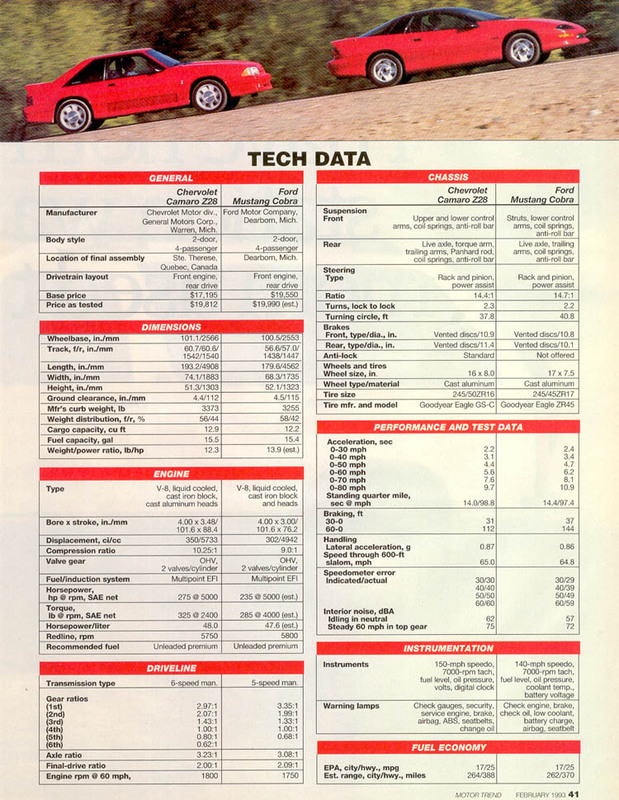 Popular magazine road test articles showed the 1987 5.0L 302ci Mustang GT and newly released 5.7 Tuned Port Camaro IROC-Z running similar mid-high 14 second 1/4 mile times on average. "Super Stock Magazine" ran a best 14.04 in their showroom stock low optioned 5-liter LX (aka: Mean Mr Mustang) during their shootout against a Grand National. "Hot Rod" magazine featured a 3-part build-up with west coast EFI performance pioneer Chris Kaufmann as he ported the stock E7 heads, extrude-honed stock H.O intake manifold along with other tuning and tweaking to manage easy 12 second 1/4 miles with his 5.0 Mustang LX, a big deal in 1987. Through the late-'80s and early-'90s,Hot Rod magazine and Kaufmann would feature many more 5-liter Mustang articles, such as "Speed Breeder" (by Jeff Smith) and Showroom Stomper (by Steve Anderson). Over on the east coast the wild gear-headed group at "Cars Illustrated" had a contributing editor by the name of Tony DeFeo (aka: Mopar Tony) who special ordered a stripped down, bare bones (A/C delete, radio delete & crank windows) black 5-speed LX hatch model. Fresh off the dealer lot with 600 miles on the odometer ran a 14.1, and after bumping the timing to 13 degrees ran a 13.91/4 mile time. We can all thank Tony DeFeo, Neil Van Oppre and Chris Kaufmann for being the leading forefathers with the 5-liter movement of the late '80s, as well as Cars Illustrated for ushering in great publications such as "Muscle Mustangs & Fast Fords" and "High-Tech Performance" magazines (now GM High-Tech Performance). 1989 all production 5.0L Mustang Speed Density (MAP) systems were replaced with the new Mass Air (MAF) systems. Many of the 1989 5-speed cars were equipped with the sought after and popular A9L computers. No junkyard Mustang passenger kick panels in the '90s were left untouched in search of A9L treasure by Mustang tuners and Hot-Rodders. The A9L is reported to have a much more aggressive timing and spark curve than other processors, and can handle serious modifications thrown at it without chip tuning. Carolina Ford Dealers was an independent Ford dealer network and the top 5.0 Mustang LX sales region in the country, as well as major NASCAR sponsor for Mark Martin and Jeff Gordon as die hard race fans might remember back in the late-'80s and early-'90s era. The Carolina Ford Dealers network special ordered 500 oxford white 5.0 Mustang Special Edition LX models to commemorate the 25th anniversary of the Ford Mustang. All CFD special edition LX cars will have a DSO# of 022 on the door tag. To read more about these commemorative LX models, check out the "Special Edition Mustangs" book through Google. 1990 Motor Trend magazine drag tested a '90 LX 5-speed model to the tune of 14.8 in the 1/4 mile, the same editors squeezed a 14.4 from a '90 IROC-Z Camaro (5.7 TPI auto) while the Mustang clique over at Muscle Mustangs & Fast Fords magazine managed a 14.3 from their tested '90 LX 5-speed model, which showed the potential of these little 5.0 powered Ponycars. Ford's SVO/Motorsports division as well as aftermarket tuners like Roush, Saleen, Trick Flow Specialties and Pro-M were developing performance upgrades that made the 5.0 Mustang a popular favorite on streets and local tracks around the country. Limited Edition "7-Up" Convertible 7-Up Bottling Company had planned to give away thirty 5.0 Mustang LX convertibles during a promotional marketing contest at the 1990 NCAA basketball finals, but backed out at the last minute. Ford would go ahead and produce 5,000 Emerald Green with white leather interior and a white convertible top LX models and install the 25 YEARS tri-bar/running horse emblem on the passenger side dash to commemorate the 25th anniversary of the Ford Mustang. Although, only 4,103 models would be produced of the planned 5,000. 1991-92 5.0L Mustang saw little changes through these years besides the introduction of the popular pony rims.... on the other side of the Ponycar battlefield, General Motors would raise the bar with an old performance axle option that was turned into a "full performance package" after 1989, the G92 optioned 3rd Gen, which really equaled out performance and turned those old street battles into a drivers race. The Mustang guys still had their lightweight LX Coupe (non-hatch trunk model) that weighed in well under 3,000lbs. which was lighter and quicker than the more popular GT and LX hatch models, the 5.0L Coupe, (aka: notchback) could flirt with high 13 seconds with ultra-low 14 second 1/4 mile times straight off the showroom floors, and only real threat to the infamous Buick Grand National and Regal T-Type turbo cars... the notchback LX Coupe models were the hot ticket, and would hold the title for Ford... until GM released the factory 275hp LT1 powered 6-speed in the Camaro/Firebird the following year. Summer Special FEATURE CAR In 1992 Ford produced a little over 2,000 limited production 5.0 convertible LX models, better known as the Summer Special or Feature Car, all in beautiful Vibrant Red with black carpet, dash, console and white leather seats with black piping, white pony wheels, painted side mirrors and unique rear spoiler. All '92 Summer Special models will have "FEATURE" stamped in the door tag. SSP (special service police) models were used by State Police Departments all over the U.S as highway pursuit vehicles to chase Hot Rods and Porsche driving drug runners. 15,000 of these SSP models were produced from 1982-93... They had Heavy Duty cooling systems (blue silicone hoses) and HD batteries with 130 amp alternators, heavier Stabilizer bars, reinforced floor pans and certified 160mph speedometer. The 5.0 engines in the SSP were no different than the roller cam, forged piston '86-'92 and cast piston '93 cars, multi-port EFI 5.0 engines of the GT and LX models. "This Mustang chases Porsches for a living" was one of the ads run by Ford in the early '80s. 1993 would be the last Fox-body Mustang (although the platform/chassis would run up through 2004) horsepower dropped in the GT and LX models to 205hp. Cast pistons replaced the stronger forged pistons used in the 86-92 engines. The GT40 equipped SVT (Special Vehicle Team) Cobra was factory rated at 235hp. Ultra-rare limited edition Cobra R models deleted A/C, stereo and back seat, and added better brakes and a stiffer suspension for Road Racing competition. 107 of the R models were produced. Now with the new more potent SVT Cobra models roaming the streets, weekend warriors hitting drag strips and road courses, the blue-blooded Ford boys had a legitimate competitor for GM's highly anticipated aluminum-headed, high compression 275hp 5.7-liter LT1 powered 6-speed terrors. The 4th Generation Camaro and Firebird and their heavy hitting V8-Ponycar models... the Z28, Trans Am and Formula. The major automotive publications of the era recorded high 13 second 1/4 miles with the SVT Cobra and Camaro Z28 with average recorded times in the low 14 second range for both models. Muscle Mustangs & Fast Fords magazine managed 13.4 out of a stock Cobra after swapping out the factory tires for a set of drag slicks! No doubt the 1986-1993 EFI 5.0 Mustangs would become Generation X's Musclecar and voted "best performance car of the '80s" by multiple car publications. The Foxbody Mustang was the best bang for your buck of their era, the absolute pound for pound champ of the '80s!